One of the most inexpensive home interior updates is changing the color of your walls. 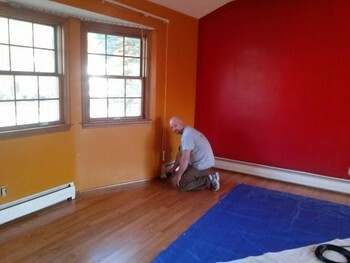 So go ahead and give your room a whole new look with a bold color choice. From pomegranate to ecru, get the exact color you want with ScreenCoat Painting & Flooring LLC's computerized color matching system. ScreenCoat Painting & Flooring LLC is proud to offer our customers quality interior painting. Our interior painting services include walls, ceiling painting, molding, woodwork, and more. We've been in the home improvement business since 2001, making homes look their best. Call (978) 216-2016 for a free painting estimate. ScreenCoat Painting & Flooring LLC takes care to protect all surrounding areas and furniture before painting. Next, we wash the entire surface to remove excess dirt, grease, and stains. If necessary, we will remove wallpaper, border, and adhesives. We apply a professional grade primer to get the best possible uniformity of color. Our meticulous painters use a variety brushes and application methods to give you the best possible coverage. Choose from standard interior paint choices to get the sheen you want: flat, glossy, or semi glossy. For high-traffic areas, choose a washable paint. ScreenCoat Painting & Flooring LLC can customize your interior painting job with a textured finish to give your room a unique look. ScreenCoat Painting & Flooring LLC paint texture options include: suede finish, textured paint, crackle, two-tone color applications, and more. Our painters have more than 18 years of experience in the home improvement business. Get the look you want with a top quality interior painting job by ScreenCoat Painting & Flooring LLC. Make your interior update complete with a fresh coat of paint on your walls, ceiling, and trim. ScreenCoat Painting & Flooring LLC recommends painting woodwork, stair risers, molding, and trim every couple of years. We use top quality paint, primer, and painting tools to give you the best possible results. Invest in your home with professional interior painting for every room in your house. Call (978) 216-2016 to find out how we can improve the value of your home.